It was great to see all who attended our Spring PD sessions in February and April! Stay tuned for the next Professional Development sessions at the School’s Out, Make it Count Conference on October 19th, 2019. 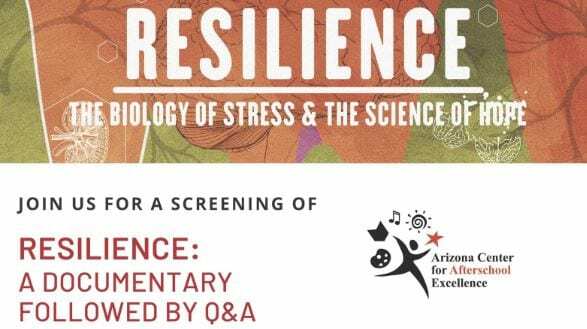 Did you miss a viewing of the Resilience Documentary? Did you see it and want to bring it to your organization for your staff to view? We are now scheduling sessions throughout Arizona. Contact us at info@azafterschool.org to schedule a private viewing at your location. Service learning and civic engagement activities can provide young people with big benefits on almost every level of youth development. Studies show that youth who take part in these activities can see improvement in their academic outcomes, social-emotional skills and their sense of connectedness to their community. Not only that, service learning and civic engagement activities and projects are often the most memorable (and fun!) of any out-of-school-time program! Join us for a one-hour webinar on how you can easily implement service learning and civic engagement projects in your program. Learn how youth voice and choice can create fun and meaningful activities that will connect youth with their community and your program. Gain practical guidance on how to find and execute projects, and how to model civic engagement values and behavior. Most importantly – learn how youth can have fun, make a difference, and create connections to their community! Registration Fee: Registration is free but all attendees must pre-register. Every year Arizona becomes home to thousands of refugee families from throughout the world. These women, children and men have waited years to leave behind dire and dangerous circumstances and create a new life in a safe, welcoming country. As refugee children and youth adjust to life in their new home, they are often in need of support, understanding and mentorship to overcome the trauma they’ve experienced. Join presenter Marge Pellegrino for an eye-opening webinar on how youth program staff can provide guidance and support to refugee youth, and help them to successfully adapt to life in their new country. Marge will share her knowledge and best practices from her 17 years working with Tucson’s refugee community. You’ll learn about how the Hopi Foundation’s Owl & Panther Project utilizes art to provide meaningful and healing experiences for refugee youth, the unique stressors and behaviors refugee youth may exhibit, and effective approaches to creating positive relationships and the sense of belonging in your program.